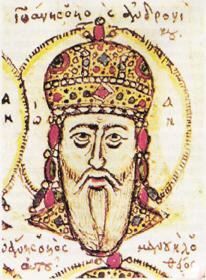 John V was a Byzantine emperor, who succeeded his father in 1341 at age of eight. His long reign was marked by the gradual dissolution of imperial power amid numerous civil wars and the continuing ascendancy of the Ottoman Turks. He reigned three times - from 1341 to 1376, from 1379 to 1390, and finally from 1390 to 1391. In 1390, John ordered the strengthening of the Golden Gate in Constantinople, utilizing marble from the decayed churches in and around the city. Upon completion of this construction, Bayezid I demanded that John raze these new works, threatening war and the blinding of his son Manuel, whom he held in captivity. John V filled the Sultan's order but is said to have suffered from this humiliation and died soon thereafter on 16 February 1391.